To Survive A Tornado, First Run To Shelter, Then Grab A Helmet : Shots - Health News In a tornado, debris flung by high-speed winds can cause deadly injuries. A sturdy shelter is the best protection, but even lying in a ditch may save your life. Or putting on a bike helmet. 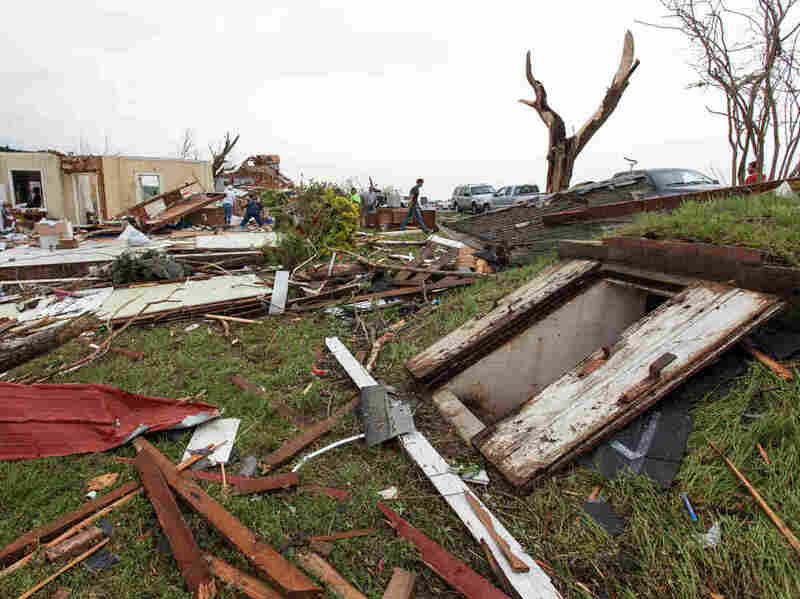 Deadly tornadoes have wreaked havoc in the South, leveling homes and claiming at least 28 lives in the past three days. And meteorologists say the threat of more tornadoes won't ease up till Wednesday. Getting to a safe place is the best thing that people can do to protect themselves and their families. That can mean a specially constructed concrete safe room, a basement, or just a ditch if you're caught outdoors. Many injuries and deaths come from head injuries caused by winds hurling around heavy objects and people. So some doctors have started recommending that people put on helmets if a twister is approaching. A bicycle helmet will do, or a football helmet. That advice is a bit controversial — as we reported back in 2012, officials at the Centers for Disease Control and Prevention say the helmet can't hurt, but want to make sure people know that getting to shelter is the first priority. If you're caught in a car, the safest option is usually to abandon your vehicle. Lying in a ditch can provide more protection, the CDC says, even though it's not ideal. And if there's no time for you to leave your car, NOAA recommends that you fasten your seat belt and cover your head with your hands and a blanket, coat, or cushion. Many people think that a highway overpass is a good place to seek shelter, but research has shown that bridges and overpasses can act like wind tunnels and make people more vulnerable. Want more? Check out the tornado safety primer by our colleague Jon Hamilton.